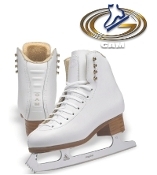 for GAM Figure Skates and Figure Skate Boots. GAM boots are manufactured by Jackson. Same great quality boot, but slightly different fit and look. To learn more about GAM products visit our About GAM page. GAM figure skates and gam figure skating boots are a quality brand. GAM figure skates have been a top canadian figure skate for many years. Made from quality leather and microfiber, GAM skates are one of the best brands for instructional and advanced skating. From beginner level figure skates like the gam pirouette, gam stella to the intermediate gam concept you will not go wrong when selecting gam for your figure skating needs. Kinzie's Closet has a great selection of girls figure skates, womens figure skates and figure skating boots.